The Den Holder Junior Type Orifice Fitting is a single chamber orifice fitting used with an interchangeable orifice plate and removable sealing O-rings. It is designed for simple and economical checking and replacement of an orifice plate in measurement installations. The few parts of the fitting are: the body, the sealing bar, the orifice plate, the clamping bar with its sets of bolts, the drainplug and the tapping plugs. 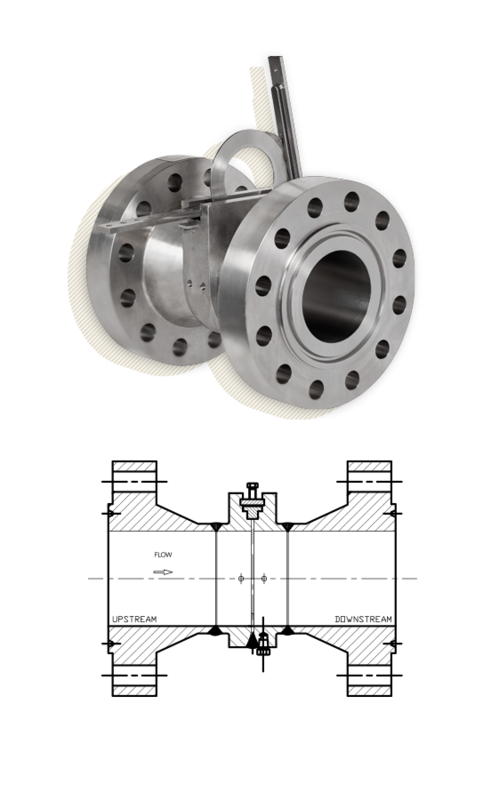 The fitting may be installed in any position on either horizontal or vertical pipelines. If the orifice plate is lifted through the top of the fitting there is no spillage of liquid service. Before changing plate, the pressure in the line or meter tube must be relieved. With the Den Holder Junior Type Orifice Fitting, checking and replacing the orifice plate has become a fast, one-man job that only requires a few simple actions.